These are all the projects I'm working on at the moment. ReactJS.NET makes it easier to use Facebook's React and JSX from C# and other .NET languages, focusing specifically on ASP.NET MVC (although it also works in other environments). SimpleIdentity is a simple ASP.NET 5 authentication and identity provider, ideal for smaller websites. Valid users are specified in a simple configuration file rather than a database. The VCE ATAR calculator allows you to estimate what your ATAR would be, based on your study score estimates. The previous year's scaling report is used to estimate what these study scores would scale to, and then the aggregate to ATAR table is used to estimate the ATAR. This is one of my most popular sites to date. As shown in the screenshot, the VCE ATAR calculator uses the same design as Syte. This section lists all the projects I have completed, as well as projects that I was previously working on but don't update any more due to time constraints. zURL is a URL shortening service. Basically, it lets you enter loooong URLs, and make them into nice short ones. Due to the large number of shortening services available these days, I wasn't going to update it much. However, I totally redid the site in February 2010, mainly as an exercise to learn Kohana 3.0. I may eventually open-source the site and its code. NodeWhiteboard is a simple whiteboard app using Node.js, SVG (via Raphaël) and Socket.io. 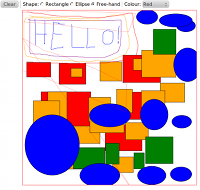 It allows users to draw stuff and see updates in real-time. Pmacct-frontend is a quick and ugly statistics frontend for pmacct for my personal use. A web-based frontend for the high-performance command-line torrent client rTorrent. The interface is inspired by uTorrent. Sharpamp allows you to easily write Winamp plugins in C#. It provides a library for access to the Winamp API, and a Visual Studio template for creating Winamp plugins. It is open-source, licenced under the GNU Lesser General Public License. Syte is a website that allows you to get a free whatever.syte.cc subdomain. The design for this site was coded by me, and I have reused it on a few other sites (instead of just using a plain layout). 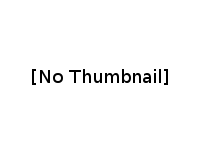 ObviousSpoilers.com is a site that lists a large number of blatantly obvious movie, game and TV show spoilers. All content is user-submitted, and users are able to vote submissions up and down, and favourite the submissions they like the most. 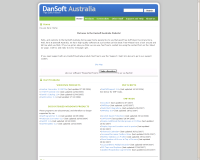 DanSoft Australia was a website that hosted all the applications I used to develop when I got bored. It is one of my oldest projects that's still live on the internet today. Unfortunately due to time constraints, I have stopped updating it as much as I used to, and instead moved on to developing websites and webapps instead. Daniel15.com once contained my blog, and a support forum for SMFShop as well as the other SMF modifications I used to develop. Since then, my blog has moved to this site, and the SMFShop support forum has moved to smfshop.com. Daniel15.com no longer exists, and redirects to this site now. 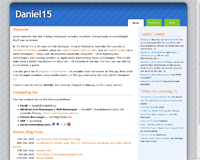 The design I made for Daniel15.com has been updated and used on this site. 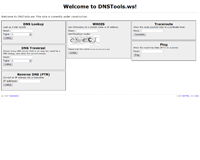 DNSTools is a site that contains a lot of DNS utilities, including DNS Lookup, whois, traceroute, ping, and reverse DNS. It is very handy for server administrators who want to check their servers are working correctly. 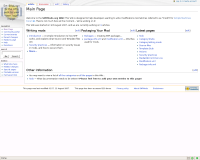 PicHost is a picture hosting website that I developed in my free time. It was never opened publically, and remains forever a beta test. Dynamic-Sig is a website that allows you to get a dynamic signature image, based on certain aspects of your computer system, as well as things like local time, and when you were last online. It runs a program on your computer, which sends updated data to the server at a regular interval. The server would then use this data to generate a unique signature image for the user. I've lost interest in this project, so probably won't update it. 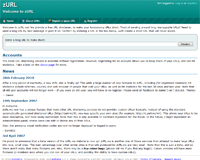 The SMF Modifications Wiki is a MediaWiki-powered wiki containing information for SMF (Simple Machines Forum) modification developers. It never really caught on, and now lays abandoned.